DuckTales… I bet you can’t think of that word without thinking of a certain catchy theme song can you? Released in the late 80’s on the NES in North America (and the early 90’s in Europe/Japan), DuckTales was a memorable part of many childhoods. 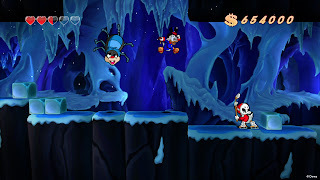 It’s non-linear style of platforming, challenging gameplay and catchy soundtrack helped the game achieve unexpected success that’s still recognised to this day. Capcom has taken note of that and has decided to give fans another chance at experiencing the game, now remastered and in HD. Over 20 years later, can Scrooge McDuck solve a mystery and rewrite history just as he did first time around? The plot for the most part is the same as the original as Scrooge McDuck travels to five different locations in (and outside of) the world, in search of rare treasures to add to his money bin. WayForward have done a decent job adding in cutscenes before and after each level to better explain what is going on and what conflict Scrooge has with rival Flintheart Glomgold and the evil sorceress Magica De Spell. While the cutscenes can be somewhat enjoyable to watch with many of the shows voice actors returning, they do have a tendency to outstay their welcome by moving at such a slow pace that you can’t help the temptation to skip them. However having the option to skip the cutscenes is a decision that I’m sure many will appreciate. Slight tweaks to the gameplay have been made here and there, which feel like they were added primarily for newcomers. While playing on easy and medium, you now have access to a map which makes finding treasures a breeze along with an easier pogo mechanic that only requires one button, rather than the originals two. Veterans of the game may look at these additions as an unnecessary way of lower the difficulty, however don’t fret as playing the game on hard eliminates the map as well as there being an option to change the pogo back to its original, trickier controls. Want to be rich like Scrooge McDuck? Learn to walk on a pogo stick. While bosses do follow a new pattern in how they attack, the battles themselves don’t really feel any different from the original for the most part and remain basic, yet fairly entertaining to play through. Bosses may decide to throw the same attack at you consecutively or change it up with another attack, all in all doing a fine job at keeping you on your feet when trying to predict what is going to come next. 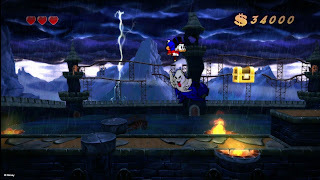 Other than that, the gameplay feels much the same as you pogo your way through The Amazon, Transylvania, The African Mines, The Himalayas & The Moon with an added tutorial level that takes place in Scrooge’s Money Bin (and yes…you can dive in!) and an additional level that takes place prior to the final level. Both levels manage to fit into the structure of the game perfectly well, which is all we could really ask for. 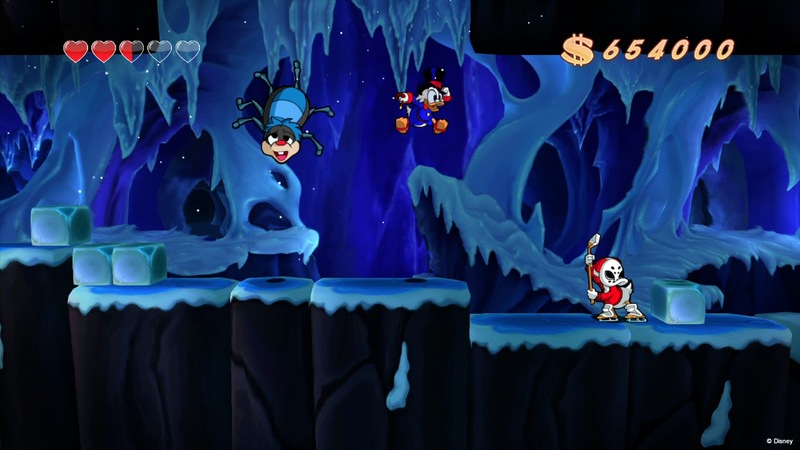 If there is one thing that I’m sure everyone that plays DuckTales Remastered will agree on, it’s that the 2D character sprites look absolutely gorgeous. Each sprite looks bright, colourful and is full of personality that’s a constant joy to look at. The 3D backgrounds on the other hand I feel should have gone down the same route as the sprites and stayed 2D. The backgrounds don’t look bad by any means, but the characters all look so great that you can’t help but feel that the game would have looked even better overall had the backgrounds received the same treatment. Three superb sprites in action. Fans of the music from the original will once again be moving their heads in time to the brilliant soundtrack on offer here that manages to match the excellence of the original. WayForward has managed to stay true to the original themes whilst giving them a high quality makeover that is a real delight to hear, with the moon theme sounding as amazing as ever. 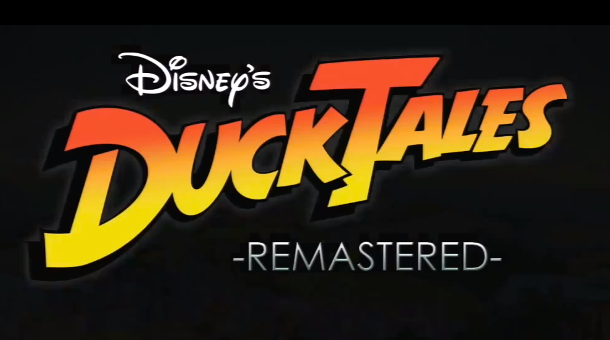 DuckTales Remastered has been designed in a way that will please those that played the original, whilst trying to entice newcomers to try out this remake of a much loved platformer. While it isn’t a guarantee that those new to the game will find anything particularly special about it, veterans are sure to appreciate the effort put in by WayForward and will look to enjoy tales of derring-do, bad and good luck tales with Scrooge McDuck once again. Oo-oo!